Have “the talk” with your kids. As a parent myself, I have to realize that my daughter’s online experiences will be vastly different than my own. At her age (she’s nine now) for me, social media didn’t even exist. Neither did Google or any of the other sites/apps that kids today are using. My first “portable” phone, for example, was about the size of a phone book (remember them?) and weighed several pounds – mostly from the battery. Today’s mobile phones aren’t portable phones as much as they are small computers that can be used for telecommunications purposes. A recent survey that I saw reported that smart phones are teenagers’ predominant device to go online. 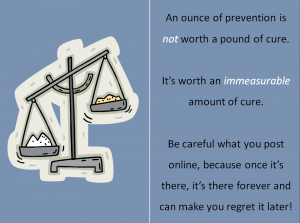 Be sure to talk about what is acceptable and what is not acceptable online with your kids. Take a look at this PSA video on YouTube. They look to us for guidance and by not setting an example or letting them know what is acceptable, they can easily get into unchartered territory, where it’s all too easy to get into trouble. If you think I’m wrong, think back to one of the most successful PSAs ever made about a father asking his son how he learned about drugs. Unfortunately for me, I waited too long to have the talk with her and she came across some pretty vulgar content online by using Google. She was searching for a book series a few years ago and when she went online, she found an image that only came up because the image was meta-tagged so that it would show up when someone searched for the book series. In other words, it was an intentional act by someone that wanted a child to find what he/she posted. If you’ve ever searched for a specific product, say a Chevy S10 truck and something from Ford came up in the results, but you didn’t know why, that’s why. Meta-tags are done behind the scenes and can be used to “help” search engines find the page even if the text isn’t included on the page itself. To help (not eliminate) this from happening to your family, adjust the filters on devices for any search engines that could be used in your home. Also, when your kids are working on their homework, have them use Google Scholar instead of a traditional search engine. Not only will it help them avoid inappropriate content; it also will provide them with better quality sources for their research. I recommend it to all of my students. 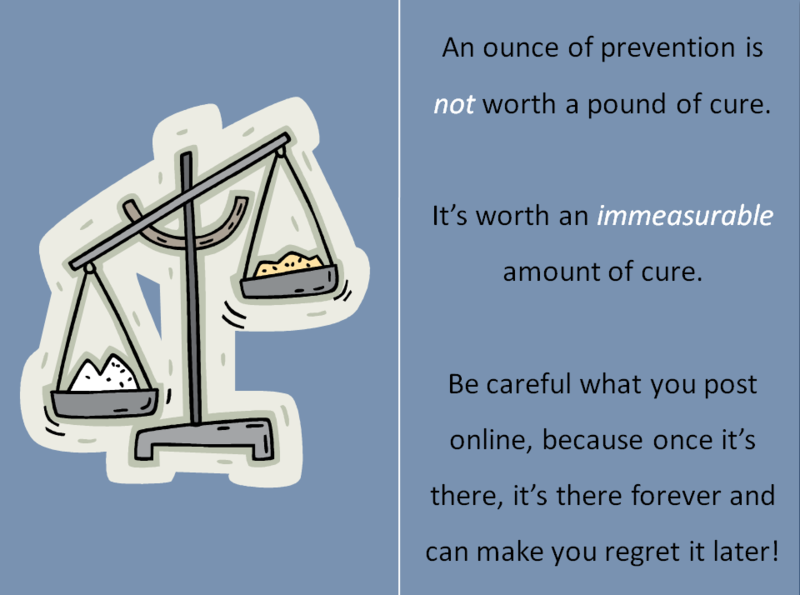 You’ve probably heard the old adage that, “an ounce of prevention is worth a pound of cure.” In the case of online predators, an ounce of prevention is worth an immeasurable amount of cure. The good news is that it’s actually pretty easy to help yourself in this scenario. The phrase that people use is to reduce their digital footprint. In practical terms, that means that people need to avoid providing the predators with the ammunition needed to assume your identity. Now, I’m not talking about stealing your identity and taking over your credit cards and such. What I’m talking about is having someone view your online profiles and learn enough about you to either target you directly or create an account of their own that looks as if it belongs to you. I know a whole lot more! His profile was the first one that I chose, so it wasn’t that hard to find a target. While some predators pick their targets for a reason, others pick them at random, as I did, just getting enjoyment out of creating problems for people. It would be very easy for anyone that wanted to pretend to be this young man to stir up some serious trouble for him. For this reason, I recommend that anyone (especially kids) using social media set their privacy settings to be as restrictive as possible and make sure that their friends do not share content from their account where others can see it. Once they share someone else’s updates, the privacy settings from the original update are ignored and they can be visible to anyone, depending on the privacy settings from the person that shared it onto their account. This may make using the sites less fun, but consider how bad the alternative could be. One area where almost everyone can improve upon is to avoid clicking on links that they do not know. Even if the link comes from a trusted friend and if the link looks like a legitimate site. Viruses and malware can easily get into a computer. In 2013, the Ms. Teen USA had clicked on a link that gave a predator total control of her laptop’s webcam. As a result, the hacker had photos of her naked and tried to extort her by threatening to release the pictures to the public. It is far too easy for anyone to make a link look like it will take you to one site and really have it take you someplace else. For example, this link that looks like it will really take you to www.socialmediaclub.org will really take you a Facebook page that I used to help educate parents. Redirecting URLs is all too easy, especially if it looks like it came from a URL shortener, such as TinyURL or even Hootsuite. Also, just because it came to you via a friend, doesn’t mean that it’s safe. It just means that both of you could be compromised. The best defense is a strong offense. This includes parental involvement and yes, oversight. Being friends or following your kids may not be enough. Only by signing in as them will you be able to see what messages they may be getting or which groups they may belong to. I know that many kids will balk at the idea of letting their parents sign into their accounts, but it literally could mean the difference between life and death. Explain it to them as if they were learning to drive. They may be an excellent driver, but there are plenty of bad drivers out there and it’s too easy to get sideswiped or even hit head-on if precautions aren’t taken! ← Social Media is Boring – Long Live the Social Web!